According to The Daily Mail — Victoria Gotti, daughter of Gambino Family crime boss John Gotti and star of reality TV show ‘Growing Up Gotti,’ had her home raided by federal agents Wednesday. 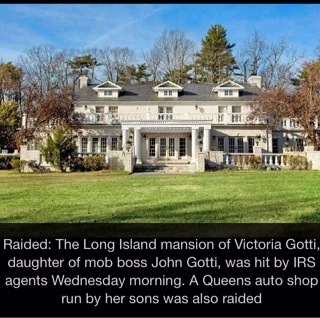 Her sprawling mansion in Old Westbury, Long Island, was visited by IRS agents executing a search warrant obtained from Brooklyn US Attorney’s office. At the same time, just after dawn, the Queens auto parts store run by her sons was also raided, dnainfo reported. Why the Gotti mansion – featured heavily in the show – and the parts shop, located on Liberty Avenue near Sutphin Boulevard in Jamaica, were raided isn’t yet known. The parts shop used to belong to Gotti’s ex-husband, Carmine Agnello, but he gave it up after serving nine years in prison on racketeering charges, separating from Victoria and moving to Cleveland. The shop is now run by their three sons, Carmine, John and Frank Gotti Agnello. All three sons, and their mom, were featured in ‘Growing Up Gotti,’ which ran from 2004-2007 on A&E. As well as her TV appearances, Victoria Gotti also wrote a series of thriller novels in the 2000s. 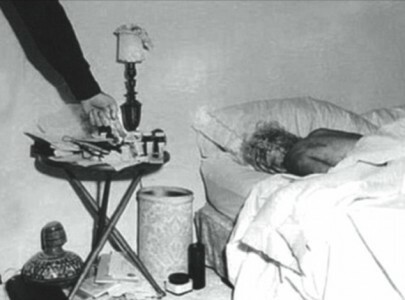 Victoria Gotti dumped Agnello 12 years ago after he was exposed for cheating on her with his Queens secretary – and was also convicted of racketeering. Read the rest of this article on The Daily Mail.